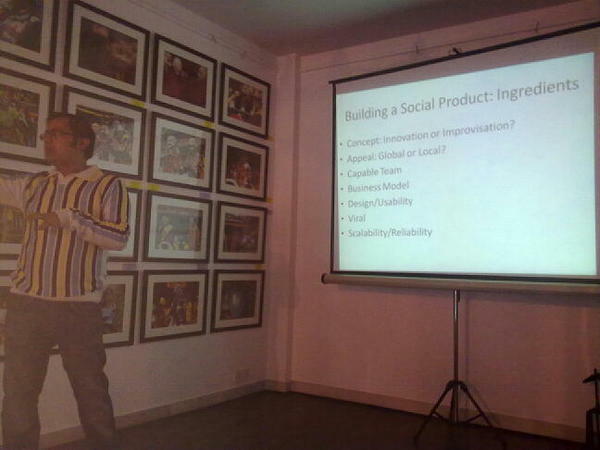 Last saturday saw the 2nd meet of Social Media Club’s Delhi chapter and I along with Dipankar Sarkar spoke about our experiences and learnings from Building a Global Social Product(Kwippy) out of India. I personally was quite excited about the talk as we generally don’t talk about products much in the regular Twitter, Bloggers and other Social Media related meets and I feel this is something that we should do often to create awareness amongst the attendees and if possible encourage people to build new products. Talking about web products they can be categorized into two categories, “Innovation” (a completely new concept, first of its kind) and “Improvisation” ( a slight modification in an innovative idea and/or a slight modification in its implementation). From what I’ve observed most social web products in India belog to the “Improvisation” category with focus on the Indian market. Be it a social network, a platform to share pictures or microblog. Though there is nothing wrong in improvising on someone’s concept and building a product for the local market but I guess most of the products in this segment fail to add any substantial value to the concept or it’s localised execution. Also, what makes me wonder is why there aren’t many popular Indian web products in other categories particularly Global products based on an Innovative concept(from India) and Global products based on Improvisation(from India) of some innovative concept. This entry was posted in conference, kwippy, presentation, social media, start-up and tagged india, kwippy, products, smc, smcdelhi, socialmediaclubdelhi, startups, web on January 18, 2010 by mayank.